We all change our minds about colors. Adobe Muse understands us. To keep colors consistent throughout our websites, Muse allows us to save the colors that we create to the list of Color Swatches. The cool part is what happens when you double click on a color swatch. 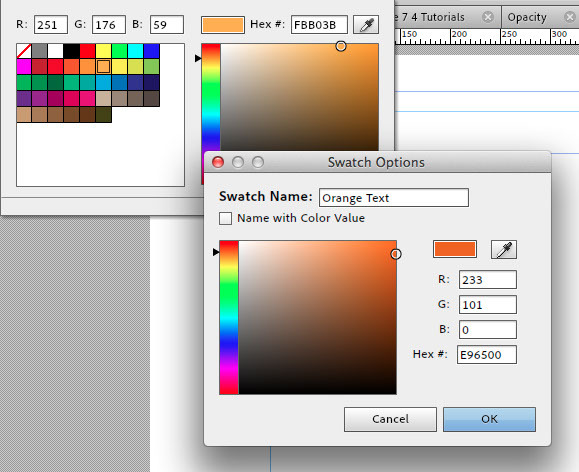 The Swatch Options box appears which allows you to name your color swatch but more importantly it lets you CHANGE the color. This changes every instance of this color swatch in my entire website. Here's an example to recap: Let's say you are designing a website for a company with an orange logo. You create a swatch of the company's exact orange, using the eyedropper lets say. You use this swatch all over the site for text, shape fills, and strokes. Then you get an email from the client titled "Updated Logo". They changed their shade of orange. Normally this would be an "Uh oh" situation. But since you used the same color swatch for every orange object, you may now double click on your swatch and use the eyedropper to pick up the new orange. When you click OK, every element connected that swatch updates to the new color.